Inspired by a madrasa teacher in Islamabad, Pakistani-American Dr. Husain Sattar is revolutionizing medical education in a similar way that Salman Khan of Khan Academy has transformed K-12 education. Dr. Sattar has written a widely used medical textbook titled "Fundamentals of Pathology" along with a series of videos called Pathoma available online. 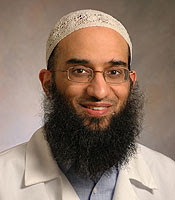 Currently an Associate Professor at the University of Chicago Pritzker School of Medicine, Dr. Sattar credits his innovation to his madrasa teacher who had the "ability to take vast amounts of information and summarize it in the most eloquent, simple, principle-based method", according to a piece written by Nancy Averett and published on the University of Chicago website. Born in Chicago in 1972, Dr. Husain Sattar, MD, took a leave of absence after first year of medical school in the United States to study Arabic and Islamic spirituality in Islamabad, Pakistan. It was in a spartan setting with a classroom that had clay walls that would heat up to 120 degrees in summer. In winter, the unheated classrooms were freezing — Islamabad sits at the foothills of the Himalayas — where Sattar sat on the floor with the other students shivering and dreaming of summer. At the Islamabad madrasa, Averett writes that there was a "Pakistani teacher who made an impression on Sattar — one that planted the seed for Sattar’s wildly successful textbook and video series on pathology known as Pathoma". “This teacher always came to class without notes,” Sattar told Averett, recalling the instructor with the gray beard who smiled often and dressed in the traditional Pakistani garb of loose pants (shalwar) and tunic-like shirt (kameez). “He would say, ‘If I can’t tell you about it from the top of my head, then I shouldn’t be telling you about it at all.’” The man lectured passionately, as if there were 3,000 people in the room instead of eight, but what the young American medical student found most impressive was his skill distilling colossal amounts of material. “He had this ability to take vast amounts of information and summarize it in the most eloquent, simple, principle-based method,” Sattar said. Dr. Husain Sattar has written a widely used medical textbook titled "Fundamentals of Pathology" along with a series of videos called Pathoma available online. Inspired by a madrasa teacher in Islamabad, Pakistani-American Dr. Husain Sattar is revolutionizing medical education in a similar way that Salman Khan of Khan Academy has transformed K-12 education. Dr. Sattar has written a widely used medical textbook titled "Fundamentals of Pathology" along with a series of videos called Pathoma available online. One good teacher in a spartan Islamabad seminary inspired a young Pakistani-American, Husain Sattar, to study medicine and create learning material that has revolutionized medical education for many generations of healers to serve humanity better. Acknowledgement: I thank my Pakistani-American friend Rizwan Kadir, a University of Chicago alumnus, for bringing Dr. Sattar's work to my attention. He has just one video from 6 years ago on his youtube channel. Is there any other site with the series? SH: "He has just one video from 6 years ago on his youtube channel. Is there any other site with the series?" Inspiring story. Looks like a spiritual man to me. Hope he can return to Islamabad one day as country needs him. And make his knowledge available free of cost. A Henry Ford Hospital cardiologist is pioneering a promising new procedure to improve the success of mitral valve replacement. Interventional cardiologist Adam Greenbaum, M.D., medical co-director of the Center For Structural Heart Disease at Henry Ford Hospital, believes the procedure — slicing a leaflet with an electrified wire through a tiny catheter before replacing a mitral valve — will save thousands of lives. Greenbaum helped perform the first procedure in man on May 25, 2016 at Emory University in Atlanta and led the second procedure at Henry Ford Hospital on June 8. Since then, cardiologists have performed nine of the highly specialized procedures, six at Henry Ford Hospital. The LAMPOON procedure is designed for patients who need a new mitral valve. The mitral valve regulates the flow of blood between the left top and bottom chambers of the heart after it has been oxygenated in the lungs. The ventricle then squeezes the blood out through the aortic valve and into the body. In open-heart surgery, doctors cut away the blocking tissues. That is not an option for those too sick to undergo open-heart surgery, leading Greenbaum and his team to search for an alternative. In the catheter-based LAMPOON procedure, the cardiologist weaves a catheter through the patient’s blood vessels and into the heart. The doctor then uses an electrified wire about the size of a sewing thread woven through the catheter to slice away the problem tissue. Greenbaum has been working with interventional cardiologist Robert J. Lederman, M.D., and fellow Jaffar Khan, M.D., at the National Heart, Lung, and Blood Institute, who first performed the technique in animals; and Vasilis C. Babaliaros at Emory University School of Medicine, who performed the first human procedure in May. Greenbaum and Lederman also performed the first transcaval access procedure in man, a novel way to access the heart by connecting blood vessels in the abdomen. A multi-center study of the procedure recently reported a 98 percent success rate for the procedure.